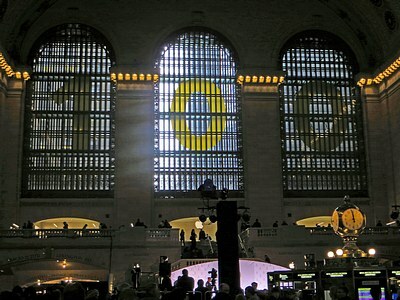 Grand Central Terminal (Reed and Stem/Warren and Wetmore, 1913) had its 100th anniversary this past Friday, February 1. 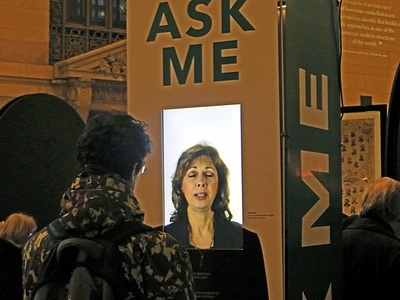 The Metropolitan Transportation Authority (MTA), which leases (the owner is an investment group called TDR Midtown Ventures LLC) and operates Grand Central, held a celebration with speakers, entertainers, and exhibits. This was the scene in the main concourse, looking east, just before noon (see the clock atop the information booth, at lower right) on Friday. Another view inside the main concourse. The passageway beneath the flag leads to Vanderbilt Hall (next photo) and beyond that to the Terminal's main entrance on 42nd Street. The concourse was more crowded than usual at noontime because of the anniversary events. Vanderbilt Hall, named in honor of the family that founded the New York Central Railroad, Grand Central's builder and former owner, was once the main waiting room, with rows of long wooden benches to accommodate passengers waiting to board intercity trains of the New York Central or the New York, New Haven and Hartford, which shared use of the Terminal. 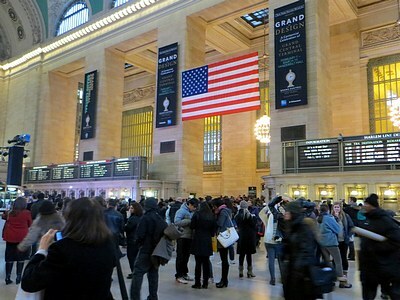 After Amtrak took over all long distance passenger service, its trains continued to use Grand Central as well as Penn Station, Manhattan's other major passenger train station. However, some years ago Amtrak consolidated all its New York City service at Penn Station, making Grand Central solely a terminal for the commuter trains of the MTA's Metro North Railroad. It is now the nation's busiest commuter station, and is about to become more so when a connection to the Long Island Railroad is completed. Commuters typically rush to and from their trains, so the need for a waiting room ended. 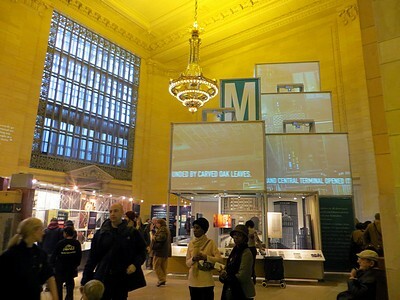 Vanderbilt Hall is now used for commercial exhibits, a holiday festival market, and, in honor of Grand Central's centenary, was filled with exhibits concerning the Terminal's design and history. High tech help was available for the curious. Before Grand Central Terminal was built, steam powered trains came to Grand Central Station, which previously occupied the site, through an open cut that extended the length of what is now Park Avenue. Electrification meant that trains could go underground for long distances; covering the tracks meant that Park Avenue could be developed as an elegant residential and office boulevard. This greatly increased the value of the land around Grand Central, as well as that occupied by the Terminal itself. During the 1950s and 60s, there were proposals to demolish or alter Grand Central in order to build a much taller office building on its site. This is the fate that befell Penn Station in 1964; its loss started a movement to preserve historic structures in New York City and the establishment of the City's Landmarks Preservation Commission. Grand Central was designated a landmark by the LPC in 1967. Shortly after that, Penn Central, the railroad resulting from the merger of previous archrivals New York Central and Pennsylvania, disclosed a plan to build a gigantic office tower above Grand Central. While this plan would have preserved the Terminal's interior, it would have destroyed the sculptures, the clock, and other beaux arts decorative elements on the exterior. Because of the landmark designation, Penn Central had to submit the plans to the LPC for approval. People who wanted to preserve Grand Central, prominent among them Jacqueline Kennedy Onassis, opposed the proposal. The LPC twice denied it. Penn Central appealed to the courts, and the case eventually went to the U.S. Supreme Court, which held that the landmark designation and the LPC's decision did not amount to a "taking" of Penn Central's property without compensation, in violation of the Constitution. This proved to be a "landmark" decision in both the sense in which lawyers use that term and in the sense in which historic preservationists use it.